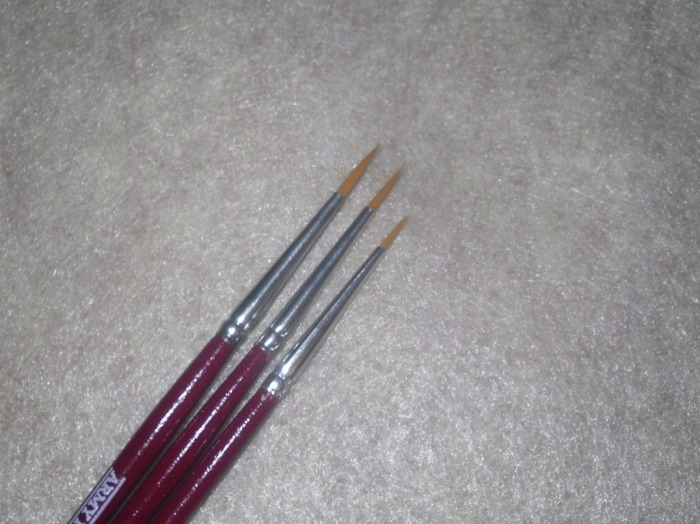 The latest manufacturer of brushes up for review today is The Army Painter. These guys gained popularity initially for their aerosol paint primers, and most notably their Quick Shade dip solution. In the past couple of years they've branched out a bit more by offering hobby tools, and now even their own line of acrylic paints for hobby enthusiasts. Their brushes have been available for quite a while now, so they're not new, but they are interesting and quite unique in presentation. While most brushes are defined by a number, which signifies what size the brush is, like a #1, or #3/0, etc, the Army Painter has taken a different approach. They don't define their brushes by size with a number, instead they define brushes by their usefulness. This I thought was a unique approach, and really, it just makes sense. This design is aimed towards new hobbyists, who may not realize what the difference is between a #2 and a #0, and between a #0 and #3/0, and so on. There are two lines within the Army Painter range of brushes, the Wargamer and the Hobby line. 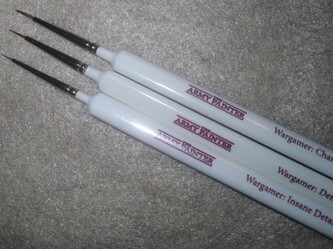 The Hobby line includes just three brushes, where as the Wargamer line is where you'll find all the rest. Some defining features are that the Hobby line are normal round red handled brushes, and the Wargamer line is made up of mostly triangular white handle brushes, and fatter round white handled brushes both. 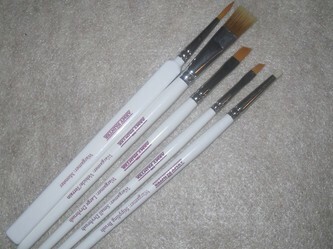 The Hobby line includes brushes named Basecoating, Highlighting and Precise Detail. At a glance, I'd say these would be close to a #2, a #0 and a 2/0 respectively. The synthetic fibers used in these brushes is Toray. While I'm not a fan of synthetics, Toray is the best of the synthetic options available. 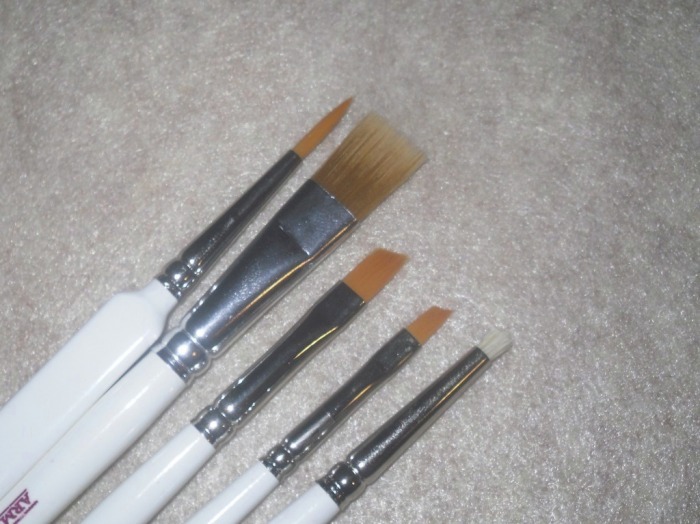 These brushes lack the spring of Sable, but they do hold a point nicely and spring back adequately, they just carry less paint than a Sable brush. 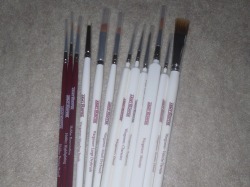 These are essentially starter brushes, and they're priced like starter brushes. The MSRP on each is $3.50, and I've seen them as low as $2.99 each online depending where you shop. In use they're not my #1 choice, but they will get the job done, and again its clear that these are their entry level brushes, for budding hobbyists. With that being the case, they set out what they aimed to do, and that's offer a nice entry level brush, at a reasonable price-point. At what they're asking for the brushes, they're still clearly quite a bit less than the Games Workshop brushes, and other popular brushes that are usually sitting near them on the counter at most gaming/hobby shops too. I've used the Precise Detail brush before too, and while it won't last as long as a quality Sable brush, it also won't cost you but half as much as most any quality Sable brush. In a pinch, if you need some brushes to get the job done, and the budget is limited, you could spend more on a much worse synthetic brush at Micheal's and other craft chain stores than you would on a Hobby series Army Painter brush. The Wargamer line is a mixed bag. 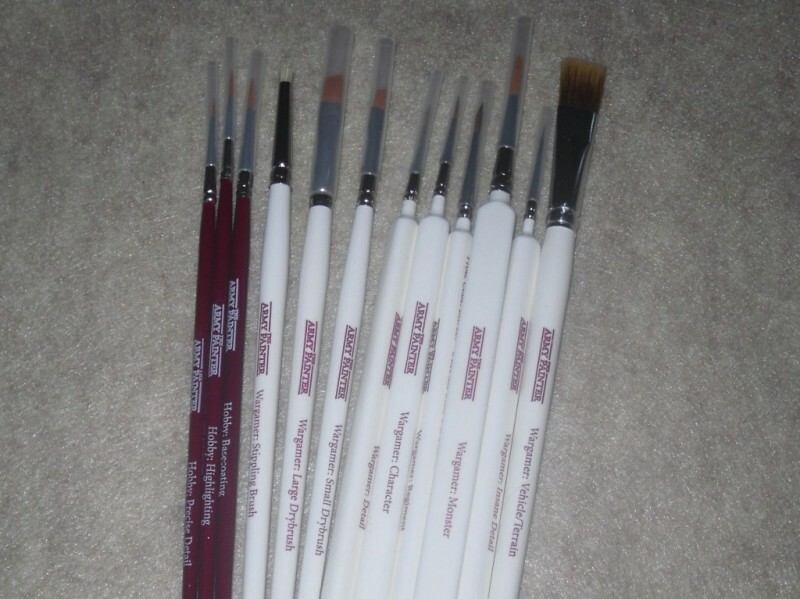 Here you have a bunch of durable sable brushes, mixed in with some synthetics. They were however smart about how they put this line together. See when it comes to workhorse brushes, which are the brushes I'd consider to be the basecoating brush, a highlighting brush, and fine detail brushes, there's no substitute for Sable or Kolinsky Sable fibers. When it comes to drybrushing, stippling, and dealing with much larger pieces like 28mm scale tanks, and very big monster models, Sable begins to be less cost effective, and synthetics then begin to make more sense. That's pretty much the way of thinking that went into the design of the Wargamer line of brushes. The largest of the brushes they offer is the Wargamer Vehicle/Terrain brush, which is a wide flat brush utilizing synthetic fibers, and a fat round white handle. This brush retails for $8.25, and can be had for as little as $6.99 if you shop around online. While I've not been a huge fan of GamesWorkshop brushes in recent years, their Tank Brush was at one time my #1 choice for vehicles, terrain and large pieces. It utilized a fat, round, and pointed design, and it really worked well for tanks and vehicles. However, after having seen this brush, I can now see how being flat comes in handy for covering a larger area quicker than what's possible via the round and pointed design of GW's old Tank Brush. There's also the fact that GW doesn't even sell the Tank Brush any longer, which now makes the Wargamer Vehicle/Terrain Brush my new #1 choice for vehicles and terrain, until something better comes along. The Wargamer Monster is another rather large brush, which at a glance to me looks like a #4 or #5. It's hard to tell though, as I don't usually ever use a brush that large, because I simply don't paint very many extremely large pieces, other than some terrain every so often. This is also another what appears to be Toray synthetic fiber brush, and this brush cost roughly $4.99 online via various online retailers, with an MSRP of $6.25, which for a brush this big, that's a pretty good deal. Although this is one of those brushes where the usefulness is pretty limited, because in general I don't usually need a brush larger than a #2 for most anything I do. I don't paint a lot of vehicles and terrain every time I sit down to paint either. I guess if you were into painting a lot of terrain, and large pieces this would be a reasonable option to pursue. Drybrushing is somewhat of a debated technique. Some claim that only amateurs need to drybrush, and it's frowned upon by many master-class painters out there. Nonetheless it's still a technique, which has it's place among all of the other painting techniques in our hobby. To perform drybrushing you really do need a brush that's appropriate for it, unless you don't mind ruining completely good brushes you may already have. I've been a fan of the GW drybrushes for years now, because quite frankly there hasn't been a lot of other options to pursue. GW isn't the only company to make drybrushes, but they've always been more readily available to me than most other options, that is until the Army Painter line debuted. The Wargamer Large Drybrush utilizes Toray synthetic fibers. The tip is cut at a 43-degree angle, and this is what makes their offering different than any of the others out there. They claim this design works better than others allowing you to hit the model 100%, with less having to bend your wrist in the process. In use it does work well, and since it comes to a small point at the highest point of the cut, I've found that it does offer a little more usefulness than most drybrushes when you want to pin-point the drybrushing effort. Carrying an MSRP of $7.25, and roughly $5.99 online via most online retailers, it's certainly a reasonably priced option. In comparison this is larger than the GW Citadel Medium Drybrush, but smaller than the Citadel Large Drybrush too. Ironically it's priced right in between the two GW drybrushes as well. The Wargamer Small Drybrush is roughly half the size of the Large offering, and it too utilizes the 43-degree angle cut design. In use I have to say I like it. 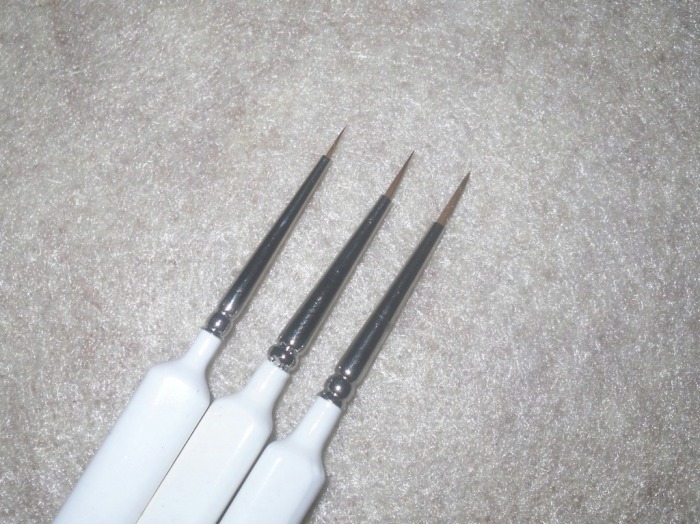 The angled cut tip, does allow you to get in and drybrush smaller areas easier, more so than most dry brushes that are cut simply flat or pointed. My only concern is that drybrushes take a beating literally, and these Toray drybrushes feel quite a bit softer in the bristles than the GW drybrushes I own. Therefore I do have to wonder how long these will last . Only time will tell. The Wargamer Small Drybrush is a hair bigger than the GW small drybrush, but smaller than the GW medium drybrush, so once again the Army Painter offering ends up somewhere right in between the sizes that GW offers. The Wargamer Small Drybrush carries an MSRP of $6.75, which is roughly $5.99 if you shop around online. 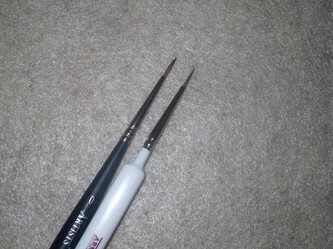 The Wargamer Stippling Brush is a unique brush. I can't say I've done a lot of stippling, outside of creating some tiny blood dots, and weathering, but I never used a specific brush for this in the past. However, now that I have one, I've given it a go, and it does seam to work as advertised. However I'm not entirely sold on the fact that I need a specific brush to splatter some blood, or add some weathering to a vehicle or character. This brush utilizes very stiff white nylon fibers, carries an MSRP of $4.50, and can be found online for roughly $3.99 if you shop around. Of all the brushes they offer, this is probably the one most could probably do without, unless they have a lot of stippling to do. These last four brushes are the very best brushes of the entire Army Painter line. These are their Sable hair fiber-based brushes. The Wargamer Regiment by design is made to paint up a large number of troops, and it's the one that most lives up to The Army Painter name. I've owned one of these for over a year, and only now is the brush beginning to really show some serious wear. I painted literally close to a hundred miniatures with this Regiment brush, which includes almost every Space Marine I own, an entire Ork army, not to mention the bulk of the Warmachine stuff I own. Even now it still holds a point, but it's clear it has seen better days, and it's time for it to be replaced. I can't say exactly what size this is, but at a glance I'd say it's bigger than a #1, and closer to a #2 more than anything else. I used this brush for everything from basecoats and highlighting, to even using the point for eyes when I didn't feel like pulling out another smaller brush. It's that versatile. Like most other quality Sable brushes, it also holds a point nicely, the belly soaks up and carries paint amazingly well, and the point has a strong spring to it to boot. The key is keeping it clean, and I have to admit, at times I was a bit sloppy with this Regiment brush, as I left in a hurry many times during painting, before cleaning and storing my brush properly. Therefore I bet it would have lasted even longer had I took better care of it. The MSRP is $5.50 on this brush, and I've paid as little as $4.50 for this one well over a year ago now, and it's by far one of the best, if not the best brush in the entire Army Painter range. It's not only useful, but comfortable, as this brush utilizes the triangular white handle design, so it's also thicker than the average thin round handle brush. The Wargamer Character is the next step down in size from the Regiment. I'd have to say this looks a lot like a #0 to me. This is definitely a good highlighting brush, and I find it useful for picking out boots, belts, and some of the smaller, but not super tiny details. Although it holds a point so well, that someone like myself could get by just fine with this brush for even smaller details like eyes and faces. This brush also carries an MSRP of $5.50, and can be had for roughly $4.50 if you shop around online. 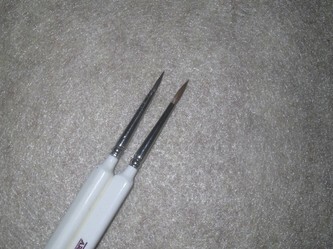 This too uses the triangular white handle, making it a very comfortable brush in-hand. Next up is the Wargamer Detail brush. This at a glance isn't a whole lot smaller than the Character brush. Again, I'll guessimate here that this is about a 2/0 in size, so it's definitely designed for the finer detail work like eyes, faces, and micro-details. This also utilizes the triangular white handle design. The Wargamer Detail brush carries an MSRP of $4.50, and can be had for as little as $3.99 shopping around online. Lastly is the Wargamer Insane Detail brush. This looks more like a #5/0 to me at a glance. It's noticeably the smallest of them all. This is the ideal eyeball brush, and for picking out tiny tiny details, like ornamental bits on cloak, medallions and jewelry on a miniature model, etc. This also features the triangular white handle, and it too carries an MSRP of $4.50, and can be had for as little as $3.99 depending on where you shop online. To cover all the rest of the minor details... These all have nickel plated ferules, and are double crimped to the brush handles. They all come with little straw toppers to keep the brush points secure during shipping, (except for the Vehicle/Terrain Brush), and every one of them displays The Army Painter logo, along with product codes and bar codes for each brush on the handle as well. They definitely made these retailer friendly with all that info on the handle like that, so they can be easily scanned, without price-tag stickers to get in the way. I like what they've done with this line of brushes. By design it's clearly definable what brush should be used for which task , and this is invaluable for new hobbyists. By foregoing the number defining method, there's less confusion for green horn wargaming hobbyists, when looking for a brush for the appropriate task. If you're an experienced hobbyist, most should be able to just as easily look at the brush, and tell by looking at it, if it's the size you want or need as well. The only area where this might cause confusion is when purchasing the brushes online, where you can't pick one up and see it in person, because even the experienced hobbyist can't tell by a photo alone how big that brush may be. This is where it wouldn't be a bad idea, for them to include what the traditional numerical sizes are in the description for each brush at their website. The Army Painter Hobby line is definitely for beginners. I can't see someone accustomed to using a Sable or Kolinsky Sable brush wanting to take a few steps backwards to use one of these. If in a pinch, and you have a small project to get done, at roughly $3 a pop, it's not a bad option, otherwise it's really hard to recommend the Hobby series to anyone other than a new hobbyist getting started. The Wargamer series is a different story. The workhorse of the Wargamer series is definitely the Regiment brush. I can't say enough good things about this brush, and its usefulness. My only gripe on the topic of the Wargamer series would be that the size difference is so minimal between the Detail brush and Character brush that I can't see anyone needing both of those. The Stippling brush is also a pretty limited use brush, and is so specialized that it's just not a must have brush for everyone. I'd say that most any gaming hobbyist could get by quite nicely with a Regiment, Character, Insane Detail and the Small Drybrush from the Wargamer series, and with those four brushes, there isn't much that they couldn't accomplish in 15mm-28mm scale. If you need to paint up 25-28mm scale vehicles, and larger bits of terrain they have that covered too with the Vehicle/Terrain brush, Monster brush and Large Drybrush. They did a good job of trying to cover all the possible scenarios one would need a brush for. Sure they could go deeper and split hairs further, by offering an Insanely Insane Detail brush equal to a #50/0 or something, and they could offer some of the sizes that go in between what they already offer, but I think for the most part they did a good job of covering the sizes that are most useful for painting miniatures. Most importantly, they've made it easier to decipher what brush would be best for which task. It's also nice that they offer thicker than normal handles on all of the Wargamer series of brushes, because they're all more comfortable to use than the average thin round handled brush. The Army Painter line of products has also infiltrated the market quite well over the past few years. 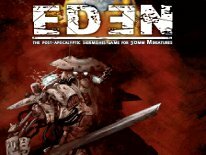 I've found their products in almost every place I've looked for tabletop gaming products locally, and online as well. They definitely have strong availability here in the US, and abroad. At the beginning of June, 2010 they launched their US Online Store for Army Painter products. So you can buy direct from them here in the US now too. One of the perks is they offer free shipping on all orders over $65, and flat rate shipping of $5.99 otherwise. 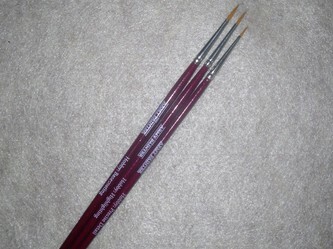 I don't foresee The Army Painter line of brushes beating out Winsor & Newton and other fine more expensive Kolinsky Sable fiber-based brushes in terms of longevity, but the Army Painter line is available in far more places for tabletop gaming enthusiasts to get their hands on a brush when they need one. The Wargamer series is also available at a price-point that makes them viable brushes for most any wargaming hobbyist, they do get the job done quite well, and they take the guesswork out of wondering what brush would be ideal for each specific task.